Dynamic agent determination based on several dimensions such as org units or type of customers. At that time it was not requested to have parallel Change Requests to extend one customer with two different change requests. At the same time the MDG Version did not support parallel CRs. In the meanwhile, this has changed: SAP MDG Central Governance framework supports parallel Change Requests since several versions. Most of the time its positioned as a feature within MDG-M (and SAP delivers standard CR Types for Material) but it can also be used in MDG-BP/C/S. At customer side the challenge with the old approach (parallel tasks within 1 Change Requests) was, that the approvers in the different countries had different SLAs defined to complete the approval. Within one CR this means that the activation for the whole record must wait for the slowest approver or workflow path. With parallel CRs this can be solved because the different CRs can be activated independently. This ends up in optimized processing and faster throughput of master data changes. Please be aware that parallel change requests are not possible for logical action “Create”. From an implementation perspective it was easy to introduce this feature: Its necessary to mark the CR Type as parallel and you need to define the scope of the CR. 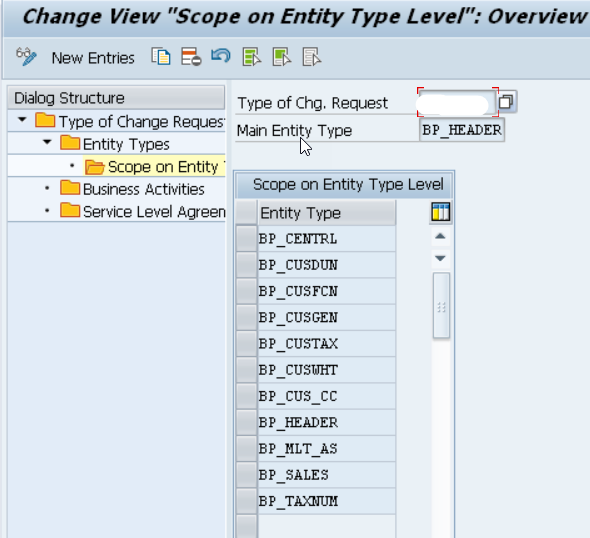 If you start a second Change Request on a customer and the first customer already blocks a “shared entity” you will be informed about the situation. You might face a challenging situation with the Tax Classifications: Multiple CRs on different Sales Areas write into this Entity. One option to solve this challenge is to define all the tax classification right from the start. If a entity is blocked by a other CR the system shows you the CR number of the corresponding CR. This solution is live since several months without bigger issues and the business users are happy because they can extend their customers on their sales areas and company codes independently from other organizational units. The business value of that feature is clear: Faster maintenance of master data and independent processing from other organizational units.